….what is that spot on my lapel? 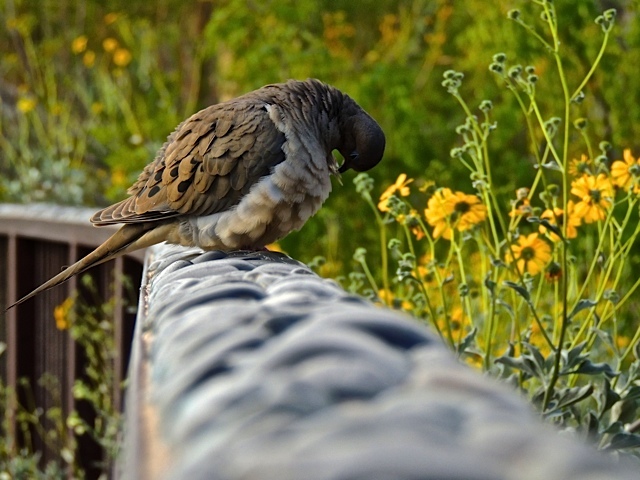 This mourning dove seems to doing some primping right in front of me. 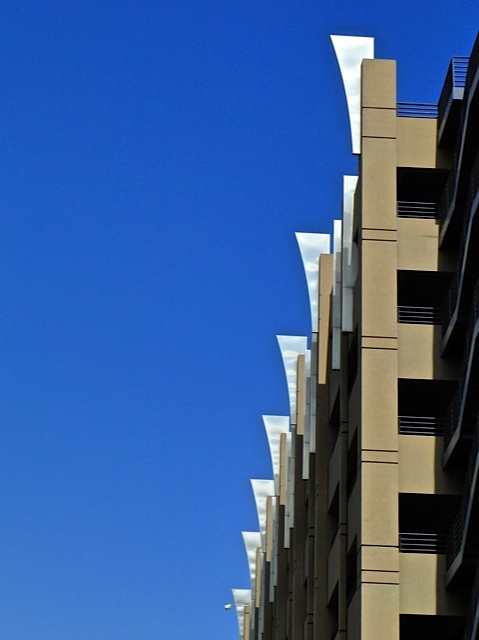 I do enjoy the sight of repeating patterns and I think these "fins" on the top of a downtown parking garage fit the bill very well. It's one of the many public garages that is also used by city of Phoenix employees. I'm sure the metal design is there to add an appealing look to what might otherwise be a drab facility and I think it works. 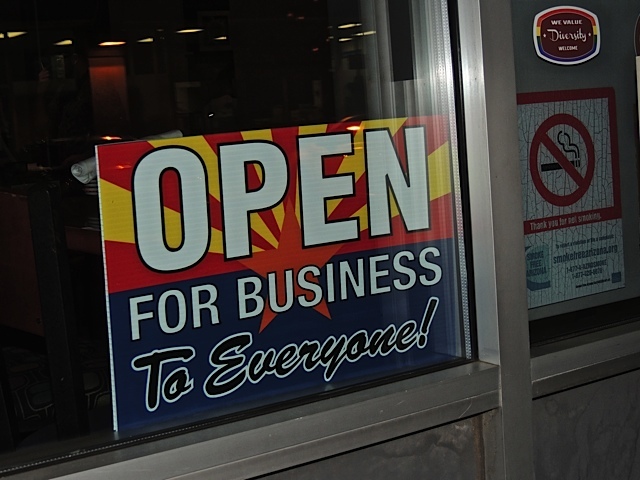 These signs are showing up in the windows of a very large percentage of Arizona businesses who are taking a stand against a bill that was passed in our state legislature making it legal for businesses to refuse to serve gay, lesbian, or transgender people on the grounds of fundamental religious beliefs. As a rule, I try to stay away from controversial issues but, this one has once again put my beautiful state of Arizona in a bad light across the country and the world. The bill has not been signed into law yet, and hopefully it never will but, a lot of damage has already been done to Arizona's reputation through the national coverage. I guess the reason I'm posting this is so that you know that the vast majority of Arizonans are appalled by this piece of legislation and that all major businesses in Arizona along with our two U.S. Senators are advising the governor to veto this misguided and hateful piece of legislation. Governor Brewer, please Veto SB 1062! As many times as I've been to the Desert Botanical Garden, I can't believe I never noticed the tiny little blooms on this cactus. I'm actually surprised I saw them on this occasion. 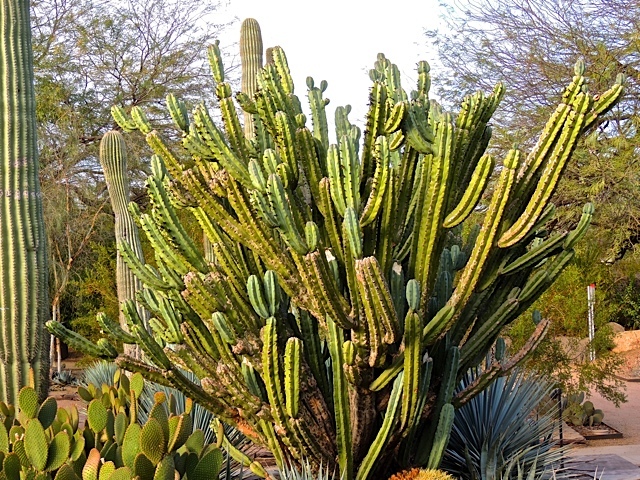 The cactus itself is so large and the blooms are so tiny that you really have to get close to see them and getting close to cactus is not always a good idea. Apparently the light was just right on Sunday because as I walked past this massive plant, I suddenly saw a flash of white. 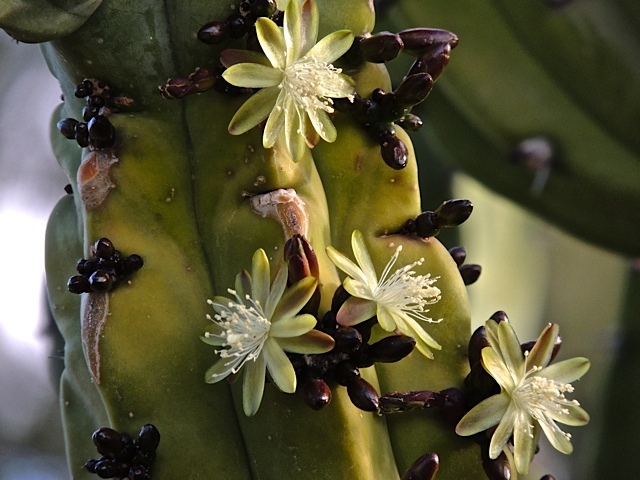 I moved in a little closer and found the very dainty little lace-like blooms all over the arms of the Whortleberry Cactus. I did an early morning (member's only) walk at the garden Sunday morning and boy was it peaceful. I do enjoy going when there aren't crowds of people and let me tell you, there have been huge crowds of people ever since the Chihuly exhibit went up. I arrived just as the sun was coming up so I got to photograph in completely different light than I usually see in the late afternoon. And, to top it all off, the birds were singing like crazy! It was a perfect morning for a walk. 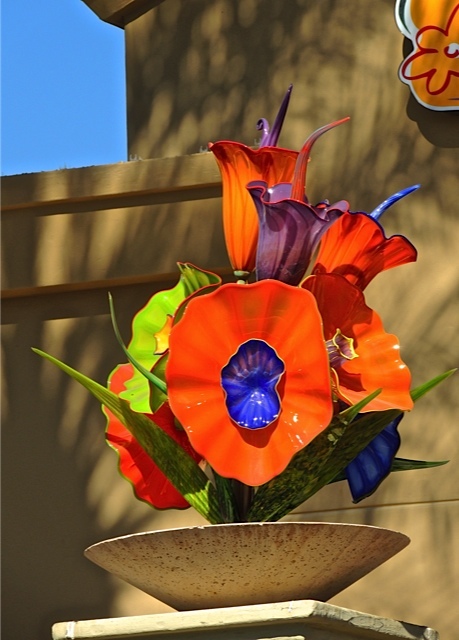 Yesterday, I went to the Fountain Hills Festival of Arts with my friend Janet. Boy, was it busy! And, hot! Walking around under the bright sun between the rows of art booths on an almost 80 degree (27C) day had me feeling like summer had arrived. 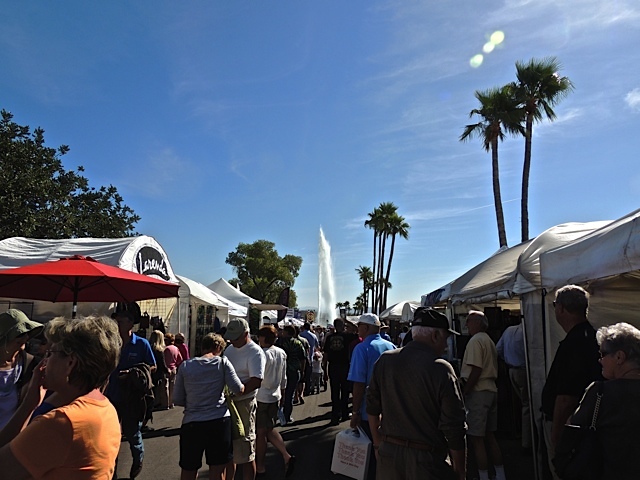 The Fountain Hills festival is one of the biggest in the valley and must be running very close to the size of the one in Tempe. I took the above photo when the Fountain Hills fountain was erupting. See it in the background? There were so many beautiful things to look at and if you had lots of money, there were a few very expensive items like a stunning table made from one large piece of rustic looking wood inlaid with veins of turquoise. It was marked at $16,000.00! 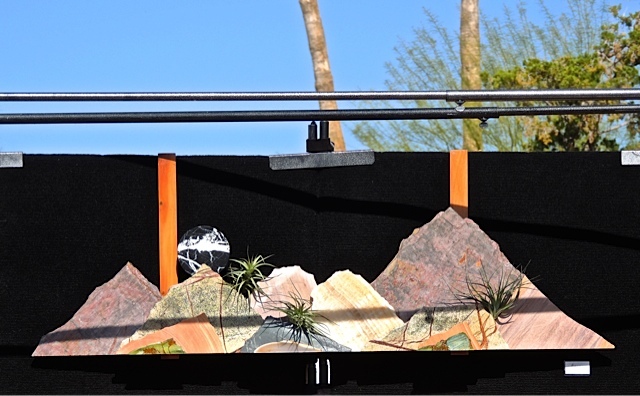 But this wall decoration made from thin pieces of stone with little pockets in it for live plants was less expensive. I didn't buy either but it was fun to look. But I did buy this great jacket with the colorful patches down the back and a shorter set of patches on the front. 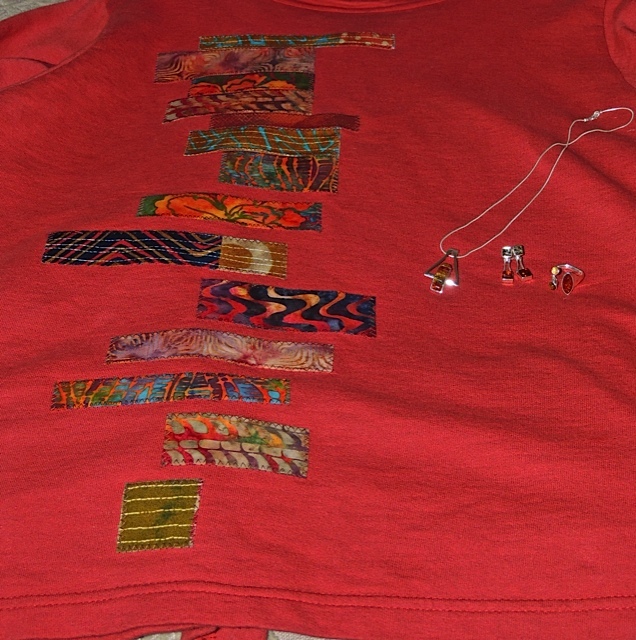 And, I think it will go very well with the amber necklace, earrings and ring I purchased too. It's hard to tell in the photo but it's made of three colors of amber from Poland. In fact, the husband and wife who were selling the jewelry were also from Poland. It was a fun day in the sun! I have a new post on Sharon's Sojourns today. I travel just a short distance from Phoenix to visit the old west. 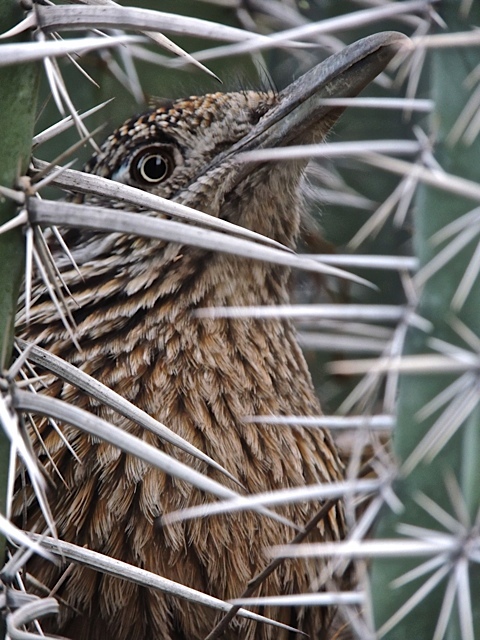 On Thursday when I was at the botanical garden, I saw this roadrunner nesting in the arms of a rather prickly cactus near the central garden area. I wasn't the only one who spotted it. There were quite literally 30 or 40 other people gathered around to watch. Last year when the roadrunner was nesting a little further away from this spot, it was before this latest Chihuly exhibit so there weren't heavy crowds roaming the garden and that roadrunner had a little more privacy. Well, except for all those high powered lenses pointed it's way but, those photographers were very quiet and professional. The crowd I saw yesterday was quite noisy and they were flashing away with a variety of cameras and cell phones and even one iPad. I'm glad this bird is pretty well hidden and even when it is seen, certainly no one would reach through the thorns guarding it's home. 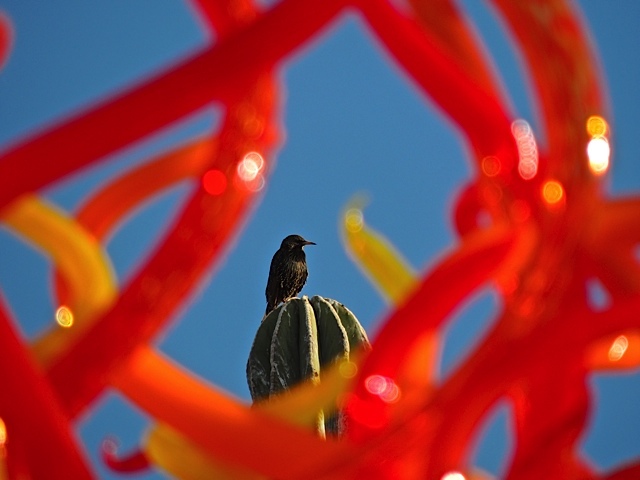 I made my weekly Desert Botanical Garden walk yesterday afternoon and while walking around, I spotted this starling sitting atop a cactus so I framed him with a bit of Chihuly glass and voila, I had my Friday shot. I can always count on the garden to supply me with some interesting shots. Have a great weekend all! …time to kiss another frog! 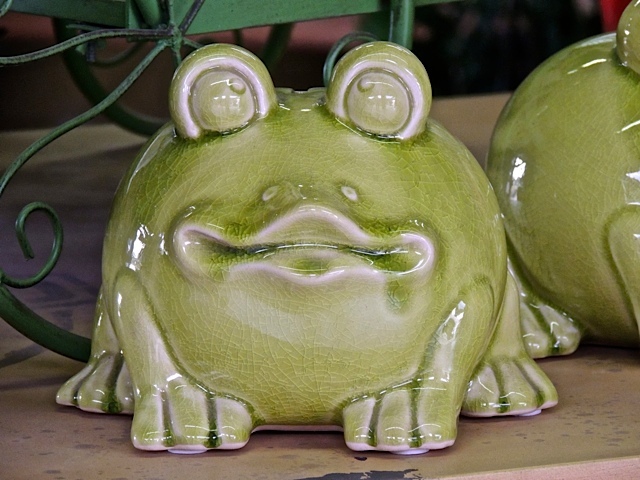 I must admit that when I saw this little ceramic frog it made me think of the old saying about how many frogs one must kiss before you find your prince (or princess as the case may be). This one looks like it's happily puckering up! 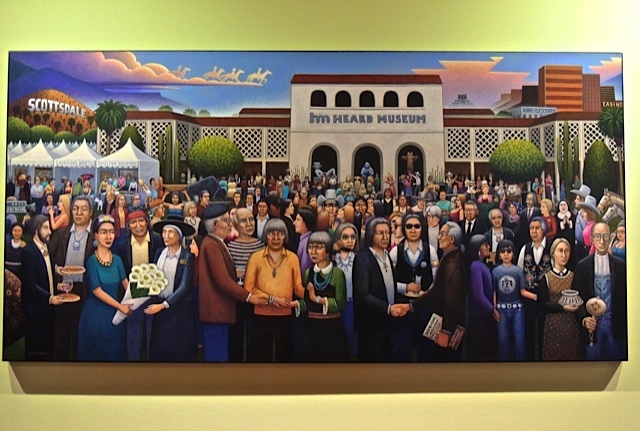 I spent a long time looking at this painting "The Tradition Lives On" by David Bradley hanging in the Heard Museum. Mr. Bradley painted this piece in 2007 and said he wanted to celebrate the 50th Anniversary of the Heard Museum Guild's Indian Fair and Market. 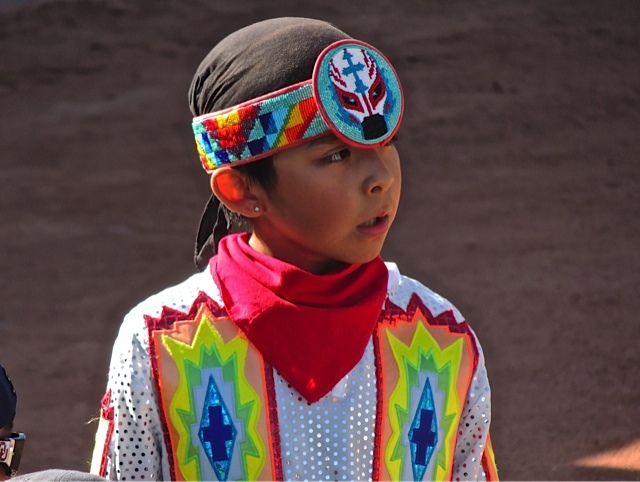 At the same time he was paying tribute to the great masters of Indian art who paved the way for all Native American artists. He also sprinkled in a few influential great artists and some pop culture figures. In the center front row is Maria Martinez a potter. 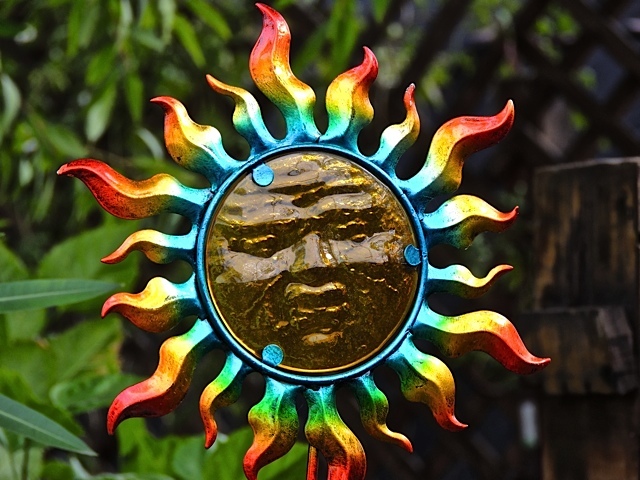 He placed her in the center because the tradition of pottery-making is an elemental form of Indian art. To her left is Charles Loloma, a jeweler and Allan Houser the famous sculptor. On the other side, to her right is Fritz Scholder a painter, he is shaking hands with fabric artist Lloyd New. Standing between them is painter T.C. Cannon. You might have also spotted, Freda Kahlo handing flowers to Georgia O'Keeffe with R.C. Gorman looking on. Behind Freda is Diego Rivera. And, did you spot Pablo Picasso wearing his trademark striped shirt? Some of the pop culture figures I spotted are The Lone Ranger near the center in the white hat and of course, Grant Wood's American Gothic figures to the far right of the painting. They are holding some Indian art pieces instead of the iconic pitchfork. You can see that there is plenty to see in this painting. One can look at it for a long time and continue to spot new people and places. I had to buy new tires last Friday so while I was waiting for the guys at Discount Tires to put them on my car, I took a little walk down the street and saw this sculpture almost hidden in the parking lot of a large jewelers store. 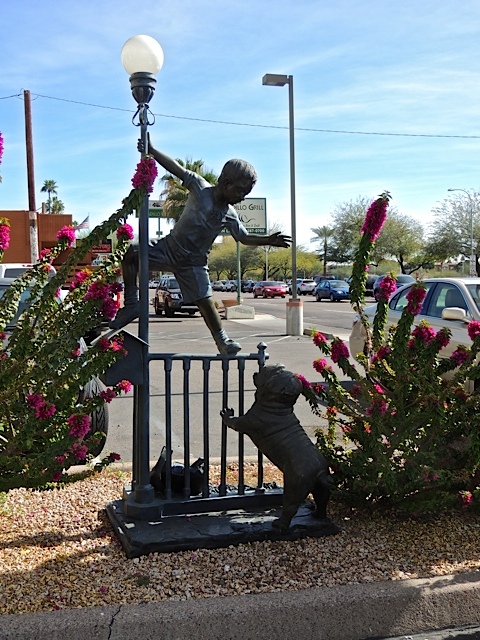 It's a playful sculpture with the young boy dropping his bag and jumping on the fence. It looks like that bull dog has him treed or is that "fenced". It's now the end of another busy weekend for me. It is just that time of year I guess. It started with dinner with friends on Friday night and then Saturday brought a reception at one place followed by dinner with some friends who were visiting from Toronto. 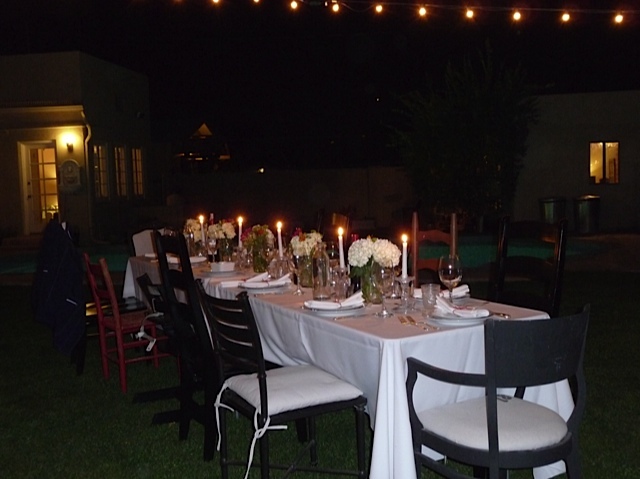 When I got to the home where dinner was scheduled I was a bit overwhelmed by this gorgeous table set up outside so that all of us could enjoy dinner under the stars……in February! My friends who were in town are the same ones I visited in Chicago last summer but, they now live in Toronto Canada and they were thrilled to be in Phoenix for a while where the weather was a bit friendlier than it is up north. On Sunday I attended the One in Ten Brunch at the Arizona Biltmore Hotel. My close friend David was the chair of the silent auction committee which did quit well. I donated one of my photographs in the auction and it sold along with a ton of other great things donated by other people. Yes, I did pick up a little something for myself, a lovely southwestern necklace that I'll put to good use. It was for a good cause, you know. 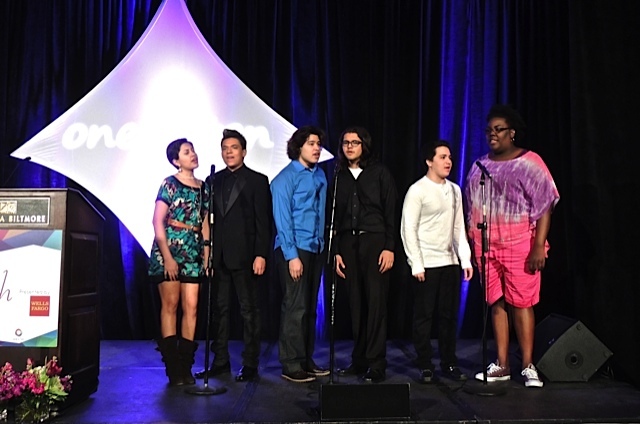 Above is the Omaggio choir who serenaded us at the beginning and the end of the luncheon. After the event, we had cocktails at the patio bar of the Biltmore Hotel. It doesn't get much better than this. Sitting on the patio of a grand hotel, sipping a glass of wine with great friends on a warm Arizona winter day with a stunning view in the background. A nice way to wind down from another busy weekend. I drove over to Scottsdale on Saturday to pick up more bird seed for the peach-faced lovebirds who hang out in my yard. When I got to the shopping center where the store is located, I saw these gorgeous glass decorations sitting on top of pillars in front of the center. 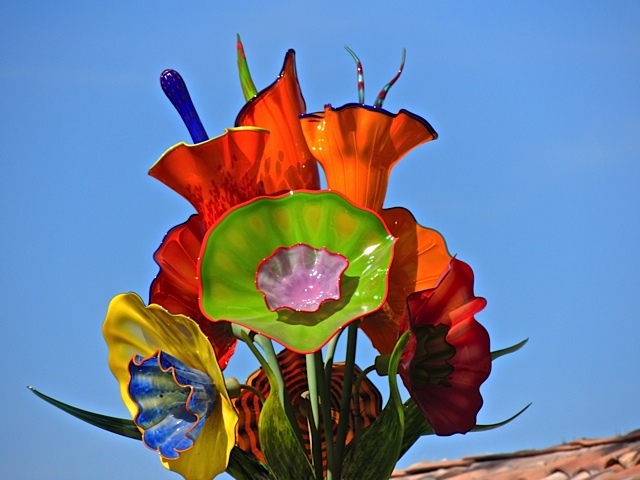 I'm pretty sure they aren't Chihuly glass but they certainly have a clear resemblance. They are so beautiful that I had to stop and take some photos. So, I'm happy I got some great colorful photos and the birds are happy they have more food. It's a win-win for everyone. Do you remember that gnarled tree I posted last summer? If not, here it is. I really do love this old, twisted tree and it's looking good all wrapped in lights at this time of year so it can be enjoyed after sundown. I have a new post on Sharon's Sojourns today. I make a return visit to a favorite restaurant. 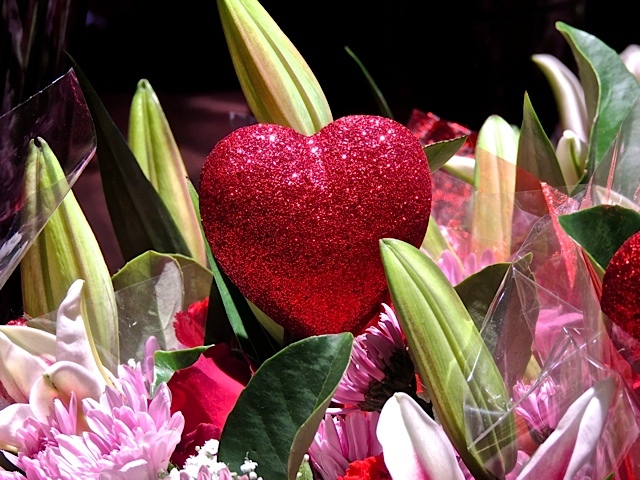 What I didn't mention a couple of days ago when I posted the photo of the lily in the bouquet I bought, was that it was a Valentine's Day bouquet with a sparkly red heart in the center of it. 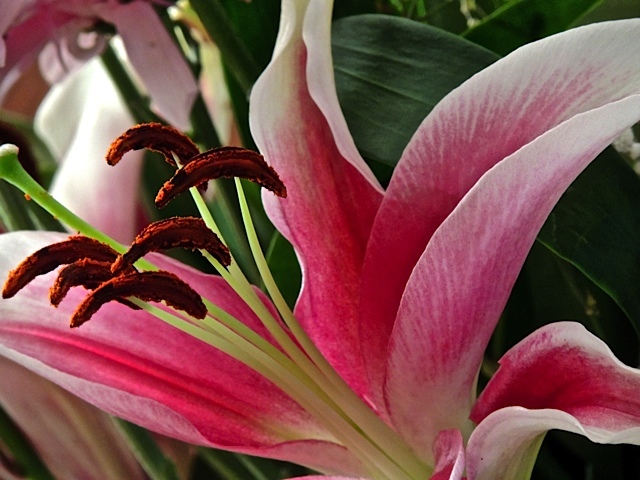 It's still sitting here on the table where I'm posting and the lilies are still fragrant. It really is one of the best bouquet's I've bought in a long time. So, all you people out there who celebrate Valentine's Day, have a wonderful one. I'm going to enjoy my bouquet along with dinner with my friend David and some other friends and I'll quite possibly enjoy a glass of champagne somewhere along the way. 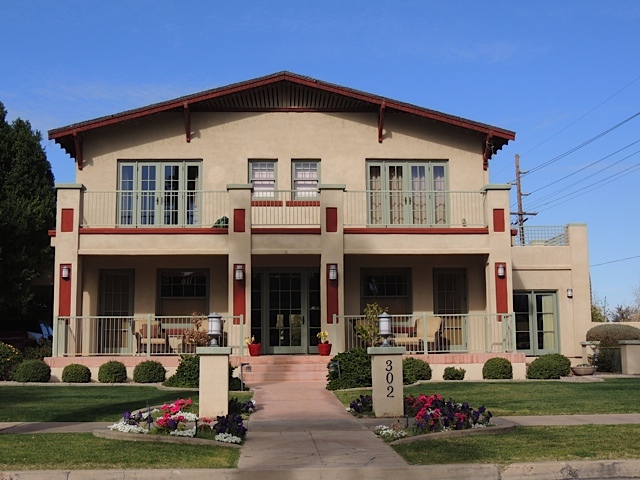 this gorgeous house is located in the Roosevelt Historic Neighborhood and happens to be right across the street from the Japanese Garden. I hadn't noticed it before but I drove down this street after visiting the garden one day and had to turn around and go back to get a photo. It really is wonderful house. I love it. 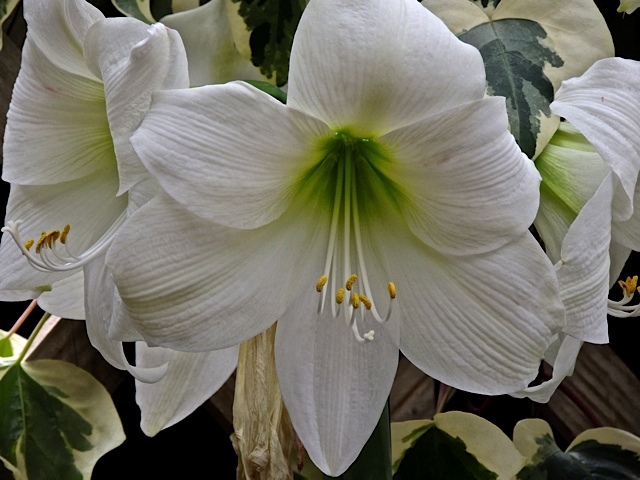 I bought a bouquet of flowers last weekend and it had seven of these stargazer lilies in it. They all have opened up beautifully and the smell is wonderful. I can smell them the minute I step in the door and since they are sitting on the table where I'm working on the computer, the fragrance has enveloped me. It sure turned out to be a great treat! 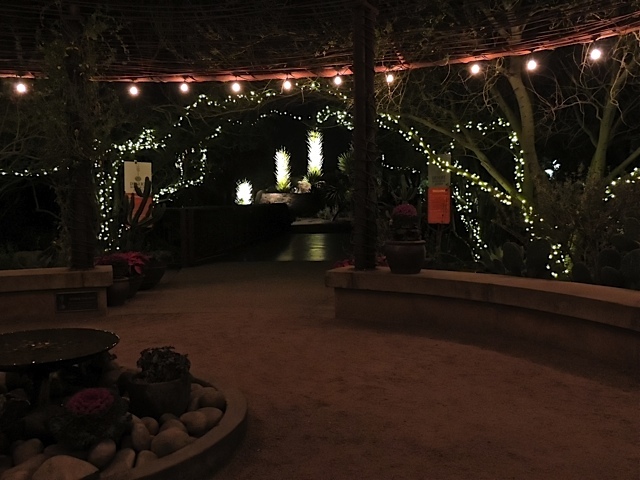 Lately, I've been making a habit of going to the Desert Botanical Garden every Thursday in the late afternoon between three and four. I usually spend the first 40 minutes walking as fast as I can while weaving my way around the crowds and then after that I wander around to take photos for a little while. This photo is from last week when we had several days of cloudy weather. 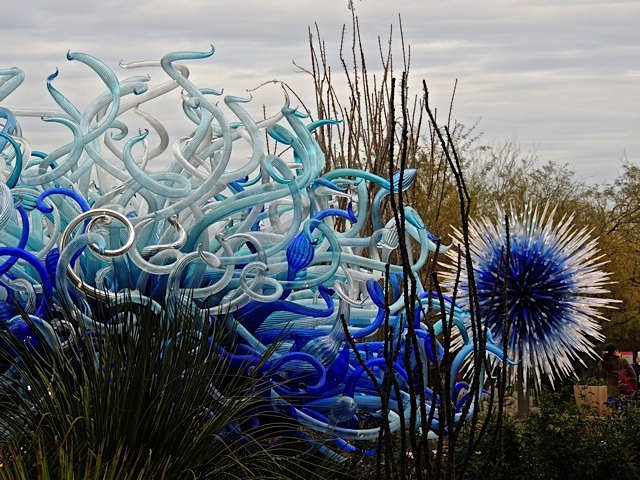 I noticed one place I could stand and catch two of the Chihuly sculptures in one photo. The blues of these two complement each other rather well don't you think? The weekend is officially over and what a busy weekend it was. 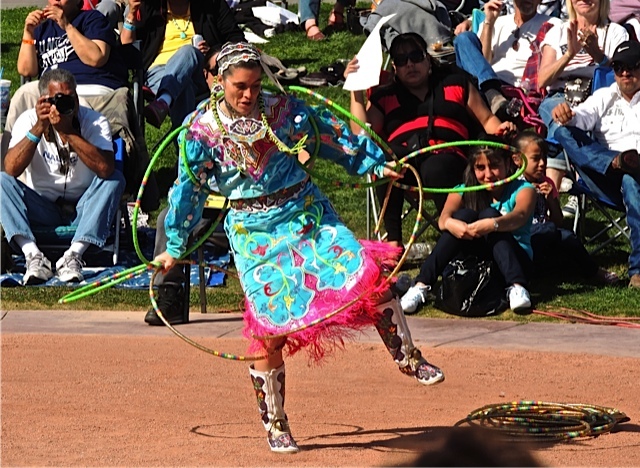 Starting with the Hoop Dance competitions at the Heard Museum that I featured yesterday and then Saturday night a Phoenix Symphony event featuring Megan Hilty. Are there any fans of the short-lived television series "Smash" out there? Megan Hilty was one of the costars of that show playing the role of Ivy Lynn, a role billed as the "seasoned triple-threat". Being a huge fan of the musical theatre, I was one of many who hated to see the demise of that show with it's brilliant music and talented actors. I was thrilled when Megan sang one of my all-time favorite songs from that show, "Second Hand White Baby Grand". Check it out if you haven't heard it before. 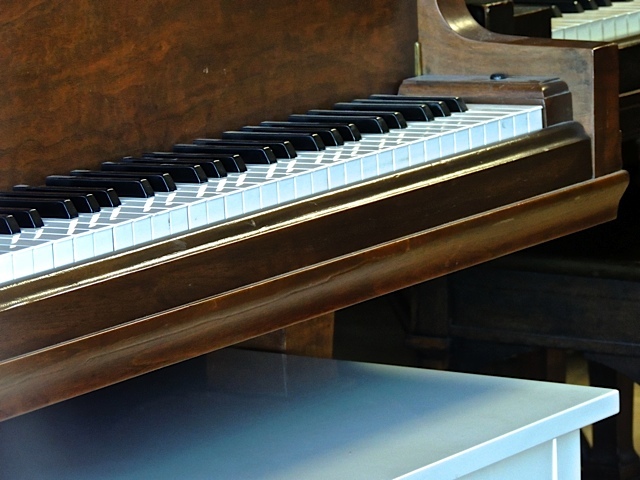 I know that isn't a white baby grand to the left but it is second hand so it will have to do. Sunday night it was the Andrew Lloyd Webber production of "The Wizard of OZ". 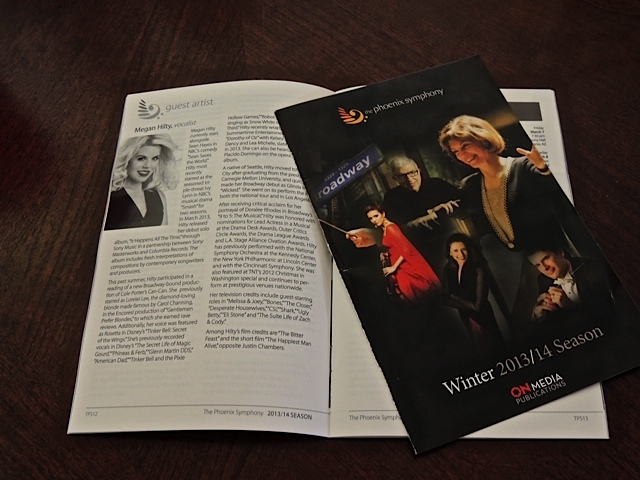 That was also an excellent production with all the music we know and love and a few new songs to enjoy. 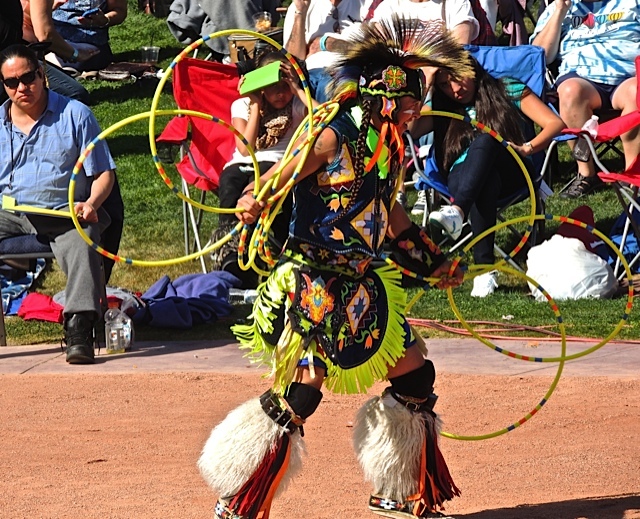 The 24th Annual Heard Museum World Championship Hoop Dance Contest is going on this weekend at the Heard Museum. 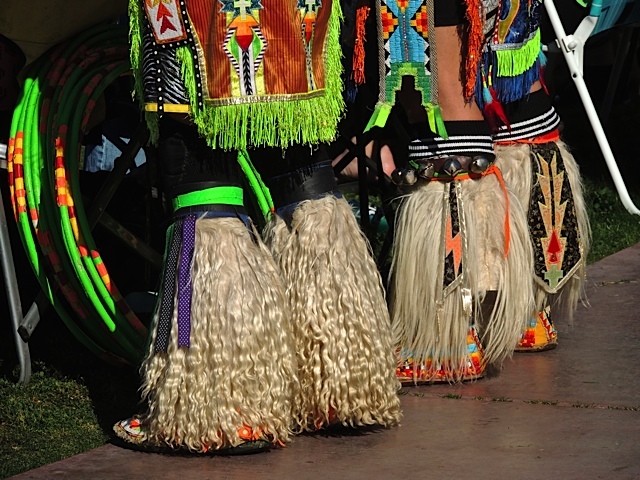 I stopped by on Saturday to take a look at the colorful costumes as well as the talented contestants. ……as well as men in several age groups. And the little ones also got to compete. This young boy is waiting his turn. 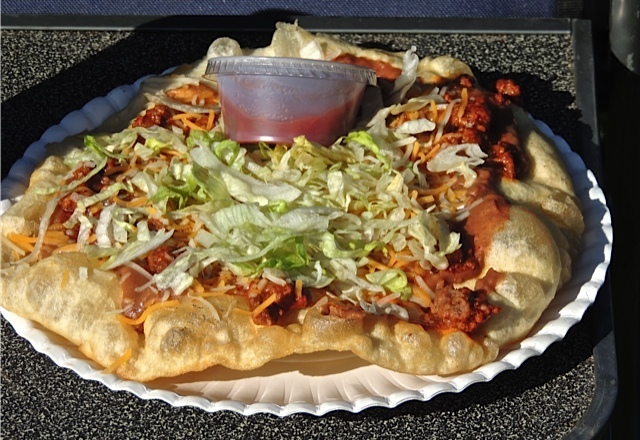 And, if contestants or visitors were hungry, there was a group selling delicious Indian Fry Bread for lunch! Once again, I enjoyed this colorful event. This plant has been growing in the front of my house ever since I moved here about 9 years ago and I've never known what it was called. I could tell it was some kind of succulent but, was never able to match it up. I finally found it the other day when I saw a similar plant with a sign saying "kalanchoe". I looked that up and finally found one just like this. 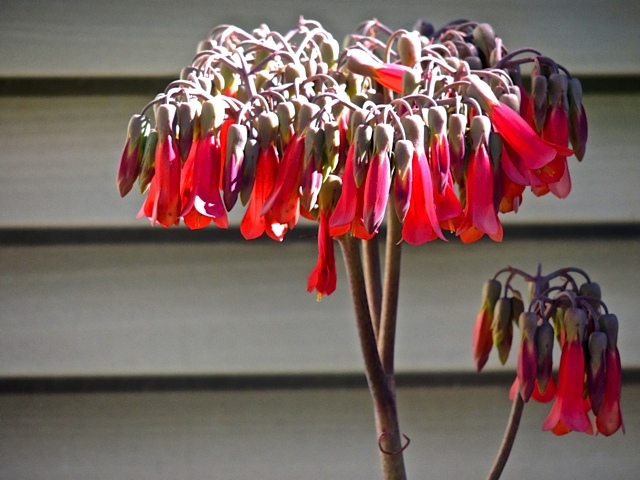 It's called a chandelier plant commonly but, it's real name is kalanchoe tubiflora. Mystery solved. I have a new post on Sharon's Sojourns today. It's a trip to a library but not to read the books. 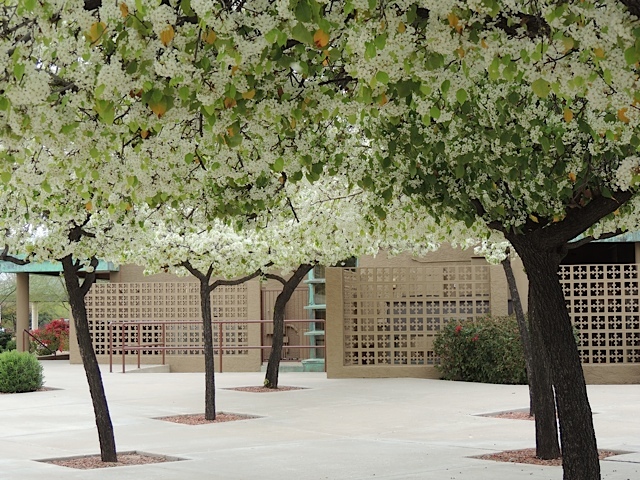 It's citrus time of year in the southwest. The commercial trees have been plucked earlier but most home garden trees still have fruit on them. 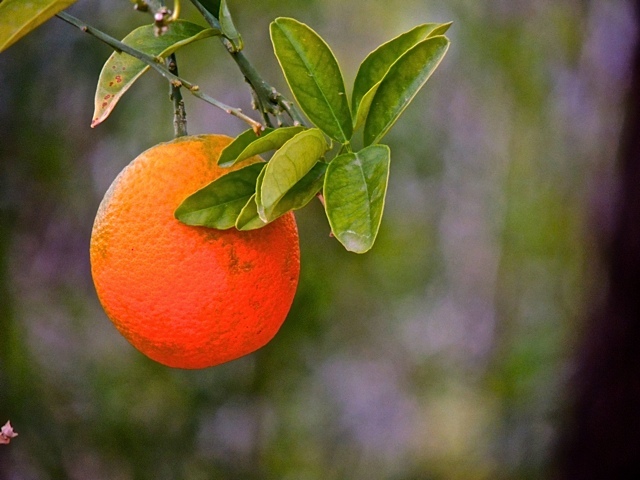 I don't have any citrus trees in my yard but, I do envy those who can walk outside and gather a few oranges to make some morning juice or grab a grapefruit for breakfast. I even envy those people with lemon trees who can make any number of wonderful things with the fruit presented to them. The possibilities are endless. 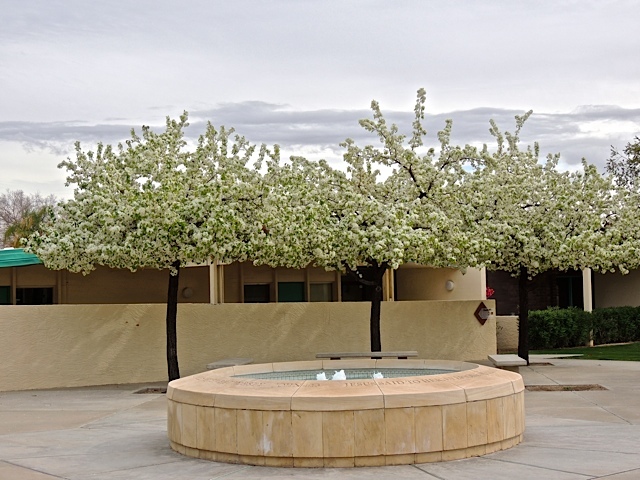 In addition to the aloe blooming right now, we have the flowering pear trees also blooming like crazy. They really are beautiful. I wish their blooms would last longer than they do. By the end of February they will be all gone. 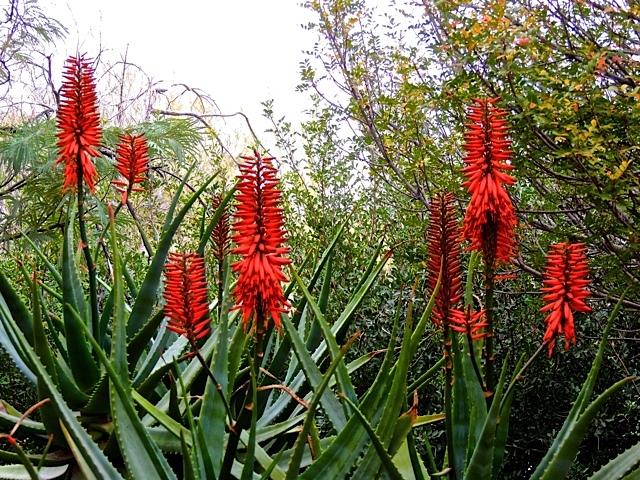 It seems to me that it's just a bit early but, the aloe plants are blooming like crazy. We did have some very warm temperatures in January so maybe that gave the plants a little encouragement to start their spring show. This one stopped me in my tracks when I was out for a walk. I have a new post on Sharon's Sojourns today. A wild west adventure is on the agenda. I'm not much a beer drinker but I do admire the fancy draft pulls that I see at restaurants. 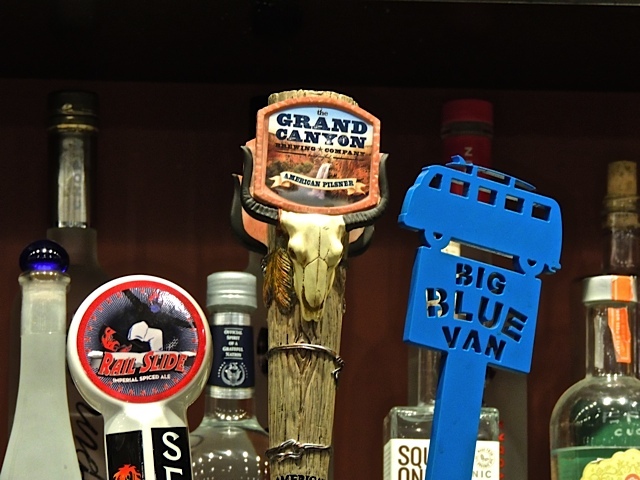 I was sitting at the bar at Gertrude's at the Desert Botanical Garden when I spotted the Big Blue Van pull. That Grand Canyon pull is quite elaborate but, the blue van caught my eye. It didn't entice me to try the beer but I did order the dessert. 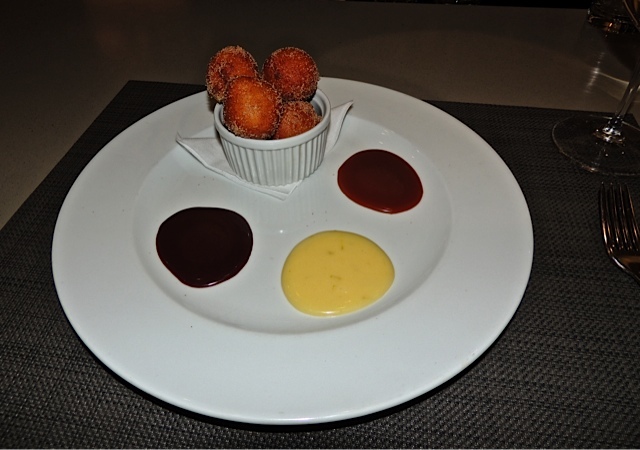 A bowl full of doughnut holes with three great dipping sauces, smoked dark chocolate (yum), lime curd (smooth) and salted caramel (slurp). Yes, I ate them all. Thought I'd start the week off with some sunshine! I found this garden ornament at the nursery I visited on Friday. I might have to go back and get one of these. I like that bright sunshine look. Friday was very cloudy here in the normally sunny southwest. Those solid, grayish clouds aren't very good for taking landscape and architectural photos but, it's perfect for taking portraits, and flowers and most close-up shots. So I took advantage of the light and spent and hour or so wandering around a large nursery. I wasn't sure they would like me taking photos instead of buying but they seemed okay with it. In fact one sales person said "it's a perfect day for taking photos, isn't it?" Yes, it was perfect. 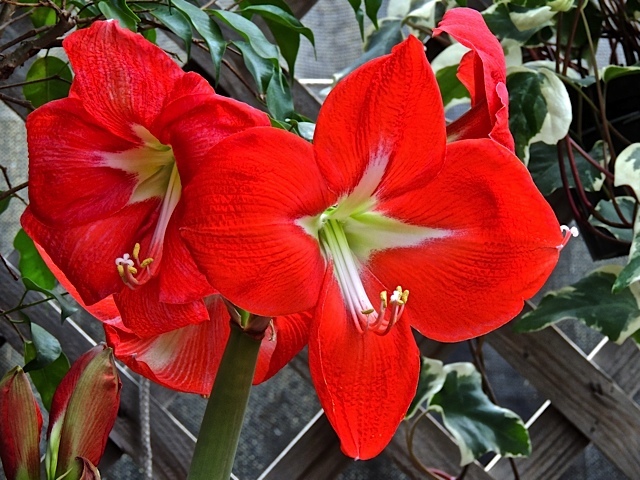 The two above are amaryllis. I'll fit in some of the others I took on another day. I have a new post on Sharon's Sojourns today. Pilgrimage is the subject of this post. Today is the first of the month so this is the day that all City Daily Photo bloggers from around the world post a photo based on a selected theme. Today's theme is "Entry". 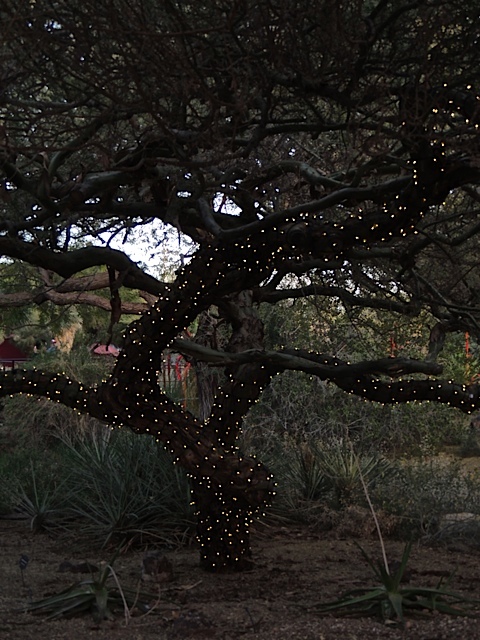 I chose the entrance to one of my favorite spots in Phoenix, the Desert Botanical Garden. I snapped this one a week ago when I was there to take some night shots. I'm standing in the circular entrance where many people wait to meet their group or a friend who is joining them. 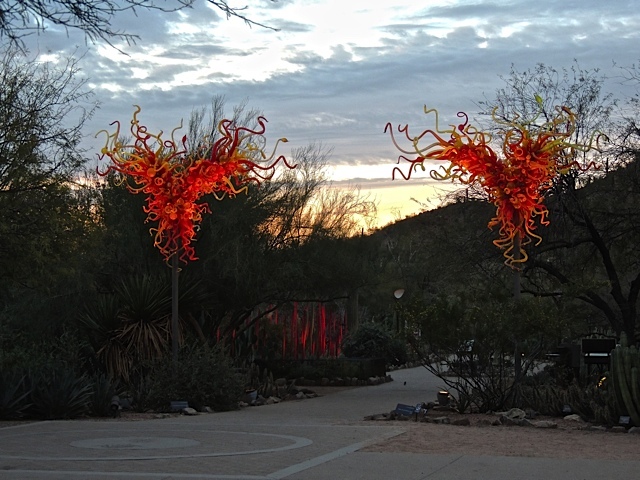 You can see the little fountain in the center and in the background you can see the three Chihuly Desert Wildflower Towers that are on permanent display at the garden's entrance. I've featured many photos of them before. You can see one here. To see how other City Daily Photo bloggers have represented the theme, click here.